I recently attended Book Expo America, the largest publishing trade event in the country. It’s exhausting: roaming dozens of aisles filled with hundreds of publishers. They’re there to promote new books, authors, services. It’s crowded and noisy and severely over-caffeinated (despite the presence of only one Starbucks in the whole Jacob Javits Center. And there are lots of free books and other swag to take home. You need comfortable shoes and a rolling suitcase to survive. I was there mainly to get new and upcoming books to review on BroadwayWorld.com. But I was also there to talk to some of my production partners (Kobo, Amazon, etc.) and check out any relevant new titles for my research. That’s when I’ve got them. I’ve struck a nerve. Those are the people who have been strongly affected by the death of a friend. 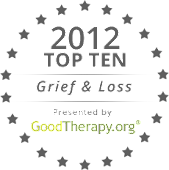 Many of them have suffered a loss very recently and haven’t talked about it. Sometimes the “you know” is followed by “no one gets it.” Sometimes they begin to tell me about their friend. Many are embarrassed afterwards by their reaction, but I know I’ve made a connection with them. They get it. They get it because they’ve been there - sometimes once, sometimes dozens of times. Let’s face it: we’ll all be there some day. They’re the people I write for: people who have lost someone who meant the world to them, someone whose life and death changed them forever. So if you’re one of those people, my book and this blog are for you. Because, yes, grief is very big. Beautiful post, Victoria. I indie-published Poems That Come to Mind about love, grief, and Alzheimer's which is like dying twice. Talk about niche, which is why I went at it alone. There is a quiet crowd of people who could be comforted by your healing books.